For many of us, Matt Pinfield was the guy who, via MTV’s 120 Minutes, introduced us to pretty much every good rock band in the ‘90s. 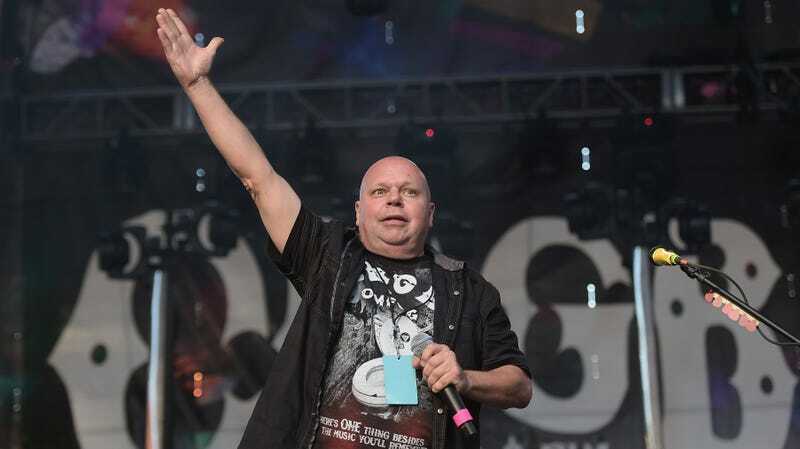 Pinfield is still working as a writer, DJ, and all-around rock evangelist, but he suffered quite the setback on Wednesday when he was a hit by a car in Los Angeles. TMZ reports that Pinfield was crossing the street when the accident happened, and that it left him with a broken leg and lacerations to his head, which required stitches. Thankfully, he seems to be on the mend and optimistic. In an update posted to his Instagram, he thanked fans for their support. “The good news is I’m so grateful to be alive and I know it will be a long psychical recovery that I will meet everyday with a smile,” he wrote. His friend, Mike Jakubow, also posted a photo of Pinfield to Instagram, showing the smiling, bedridden man chowing down on a muffin. “Guys! Matt’s eating a muffin! He’s gonna be ok,” he wrote. Somebody bring the man CDs.